The social media analytics company Sysomos has released an in-depth report (pdf) about Twitter users – “Inside Twitter, An In-Depth Look Inside the Twitter World”. According to the report, about 0.54 percent of all members on Twitter are Swedish. With an estimated 14 million members (as of April 2009), that would mean that there are at least 75,000 Swedes on Twitter. 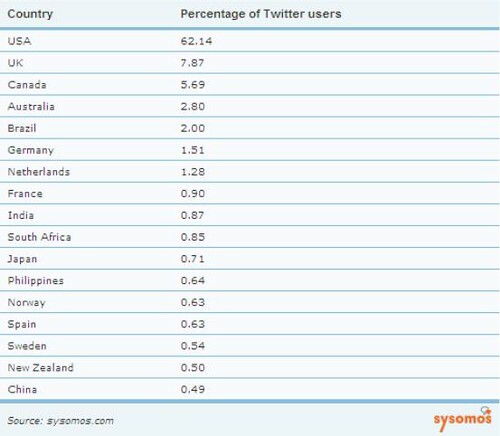 That makes Sweden the 15th most active country on Twitter. The exact number is of course hard to determine, but for the first time we at least have a ball park figure to relate to. I think that the number is pretty accurate, given how respondents answered my fourth annual Swedish blog survey earlier this year. But as the report says, a large percentage of the members on Twitter are not very active. – 50.4% of Twitter users haven’t updated their status in the last seven days. Other interesting findings in the report are for example that “of people who identify themselves as PR professionals, 65.5% have never posted an update”. If that is correct, that is quite astonishing numbers. PR pros are lurkers on Twitter. Go check the report, it is quite intersting reading. Tags: users, twitter, twitter, sociala medier, twitter, sverige. Ping.